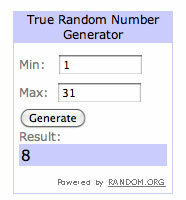 Val, you're the winner of the Lecien cheater print! I'll send you a message and get the fabric in the mail. I wish I had a piece of this cute fabric to send to everyone. Thanks for playing y'all! I added the hexagons I made in the car over the past few days to my box. So far, I've made 1,016 charm hexagons. I've got about 275 sewn together, so there are about 740 in the box. Would you believe that I haven't actually cut into my folded fabric stash for hexagons yet? This is all from scraps and swaps! My quilt may end up being bigger than originally planned because I still have lots of fabrics to add! 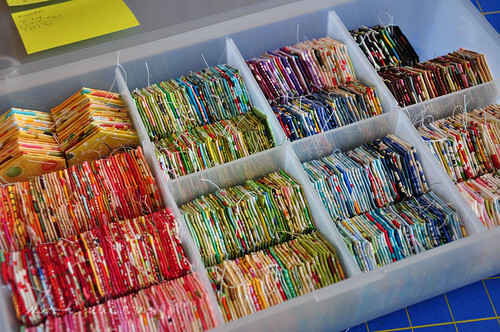 Love your box full of hexies...that's going to make one amazing quilt! Wow Melanie, you must be making hexies non-stop! Your box full of hexies is just gorgeous. I love how you have them all sorted by color. Your quilt is going to be absolutely lovely. Seeing your hexies is such a pleasure. I have mine in a similar box but just can't get them as neatly aligned as yours. Waaah! I have maybe 300 or so done. Don't know when an actual quilt will materialize but it is good mindless handwork for watching tv with my hub. The lecien fabric arrived today!! LOVE it!! Thanks again. wow! you have got a serious hexie collection! i love it! i hope mine will be as large as this soon.